Dimensions: 44.1" x 13.4" x 28.7"
If your aim is to find an industrial grade air compressor, you're in the right way. This Silentaire Sil-Air 200-100 Compressor is a real device from Silentaire Technology for expert designers. The name of the company has already become a synonym for quality and reliability in the industry of quiet air compressor manufacturing. And that is not by chance, because it is Silentaire compressors that lead the market in a time of noiseless, efficient and powerful air compressors. A large team of adventures and skilled personnel work to improve operating capabilities of Silentaire compressors while optimizing their costs. In addition to that, the company produces several compressor lines including over 100 different models. These can meet every application requirements so that every customer could benefit from Silentaire products. 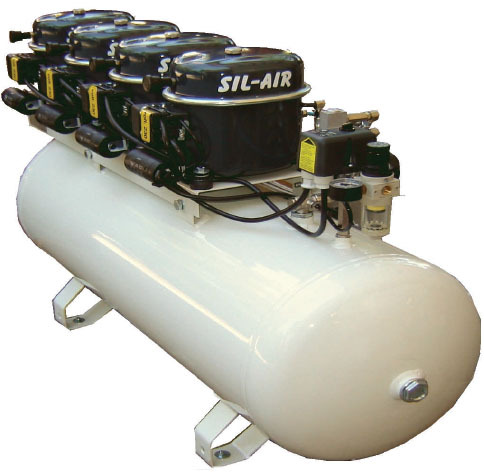 The Sil-Air 200-100 is one of the air compressors from Silentaire Sil-Air line. All units of this series feature almost noiseless and, what's important, completely automatic operation. Which means for you an undisturbed and comfort airbrushing job. Thanks to a pressure switch, the compressor motor automatically stops and starts when the air pressure reaches its max and min value correspondingly. This helps to prevent the compressor overheating and, hence, to prolong its life and maintain the high level of performance. a carrying handle or wheels providing added portability. Aside from that, the compressor comes with an oil bottle type ROLOIL - SINCOM/32E, instruction manual, and a tank certificate. The Silentaire Sil-Air 200-100 Compressor includes a 1-year warranty that starts from the date of purchase. According to this warranty, you have the right to get a free repair or replacement of defective parts of the compressor. Here it's important to note that only the manufacturer defines whether parts are defective or not. So, do not try to repair the compressor on your own. If tampering or bad usage are detected, the guarantee will be terminated. Besides, this guarantee doesn't cover the electric parts as well as worn compressor parts.